She was an innocent student caught up in the war against the country’s most notorious drug baron, Pablo Escobar. The attack meant Liney’s name was added to the list of over 7 million victims of Colombia’s five decades-long conflict. Returning to her home town of Montelibano, and with her hopes and dreams for the future shattered, Liney had to rebuild her life. She married and moved to a village outside of town so they could work on the land and support their two young children. But this didn’t turn out to be the idyllic move Liney hoped for. Liney is clearly still affected by the horrific events which took place around 10 years ago. She finds it hard to make eye contact whilst telling the story. Following her brother’s murder, Liney and her family were forced to flee the village and abandon their home. Liney is one of the women risking her life to help the peace process in Colombia. She founded the Association of Women Victims of the Armed Conflict, a women’s organisation supported by CAFOD that empowers female survivors of the conflict in the region of Montelibano, Córdoba, and helps them to fight for their rights. Now Liney is 44 years old, and the women’s association is going strong. She also represents other victims, lobbying for their rights on the municipal and national victims’ roundtables. But standing up for others is a dangerous job in Colombia. 186 human rights defenders were killed between 1 January 2016 and 1 July 2017, according to Colombia’s Ombudsman (Defensoria). “Some people have had to step down from the roundtable because of threats” she explains. A peace deal between the Colombian Government and FARC guerrillas was signed last year and thousands of guerrilla members have now demobilised. Yet other armed groups remain and the demobilisation has left a power vacuum in some areas, with a number of other armed groups stepping in to fill the space. 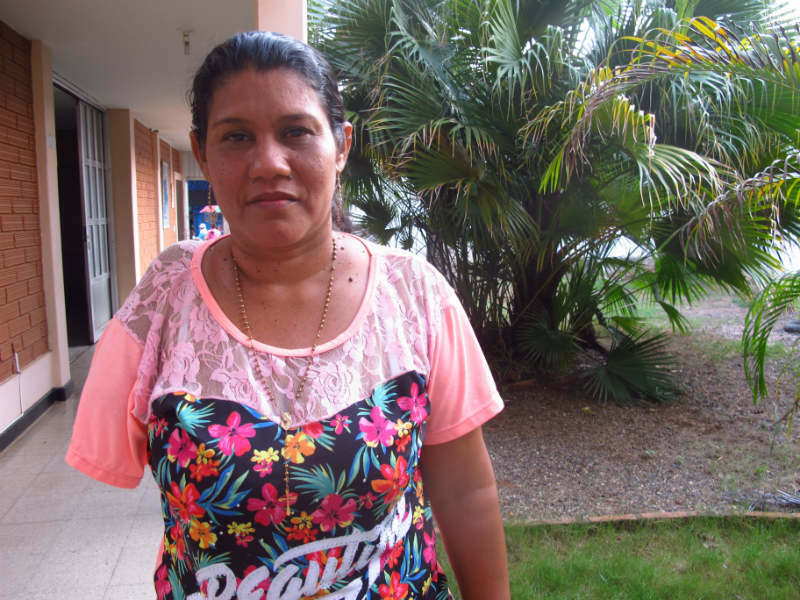 For the peace deal to be successful, Colombia will need courageous women like Liney who can help victims of the conflict open-up, tell their stories, and claim the justice and reparation they are entitled to. CAFOD’s Human Rights Defenders Programme in Colombia was supported by the European Union. The contents of this article are the sole responsibility of CAFOD and can in no way be taken to reflect the views of the European Union. Previous Previous post: Humanitarian aid is more than food. It is a sign of hope.